The century and a half long history of the Akehurst company began with the dreams of one young man, Charles A. Akehurst. Born in Sussex, England in 1828, Charles moved with his family to the United States when he was just ten years old. The family settled in the Mt. Washington area of Baltimore where Charles worked with his father, Henry, in farming until 1848 when he moved to Perry Hall to start his own farm. Nearly 30 years later, in 1876, Charles A. and his son, C. Edward, entered into business together raising vegetable plants, carnations, violets, bedding plants, tuberoses, and other flowers. Their first greenhouse was a modest 12 x 18 foot operation. They added more greenhouses made with wooden frames and glass, and they were heated with wood-burning furnaces. Branching out, in 1883, Charles A. and C. Edward began growing rose bushes in their fields to sell to the gardening trade. In the first passing of leadership for the Akehurst company, Charles A. sold his interest to his son, who led the five-year old company into new ventures. C. Edward began growing carnations to sell as a cut-flower crop. He developed many new varieties, which he sold to the trade, not only in Baltimore, but across the entire country, including the popular “Mrs. Akehurst” carnation. When carnation prices weakened in 1918, the industrious C. Edward changed his focus to growing roses. The company, C. Edward Akehurst and Sons, grew as his sons–Raymond E., Ernest H., D. Elmer, and Carville G.–followed his lead. In 1927, the sons helped C. Edward usher the business into the new era by building a range of modernized greenhouses a half mile from the original Akehurst location. The company, now called Akehurst Brothers, almost exclusively produced cut roses and rose bushes, which won numerous awards, including an award for a bunch with seven foot stems! Just three years later, brother Carville G. expanded the operation, called Carville G. Akehurst, by adding azaleas and other nursery stock to the business offerings. 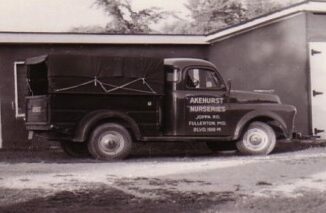 Akehurst Nurseries, sensitive to the community’s needs and the adjustments WWII necessitated, sacrificed several of its flower and plant growing fields in order to grow corn and raise chickens for eggs. Having survived the economically stressful depression and world war eras, in the 1950’s the hearty company welcomed the new focus of growing ornamental trees and shrubs, producing container plants, and landscaping residential properties. Carville G.’s sons–Carville M., William E., and Lauren D.– joined the company, a merger of Carville G. Akehurst and Akehurst Nurseries, which took on the name Akehurst Nurseries. By 1972, the company, heavily dedicated to residential landscape services, incorporated, becoming Akehurst Nurseries, Inc. The adaptable, time-tested family-owned and operated company celebrated its 100 year anniversary in 1976! Having learned how to adjust to the market’s needs, Akehurst Nurseries, Inc. discontinued its rose growing operation and converted the flower growing space into container nursery stock growing space. In another passing of ownership, in 1985, William E. bought out his brothers and brought on his own sons, William K. and Brian E. They discontinued the nursery altogether and moved forward with a new focus on design, landscape construction/installation, and grounds maintenance. They marked the new direction with a new name, Akehurst Landscape Service, Inc. Another bold step to steer the company to success, they moved operations to a leased facility in White Marsh. 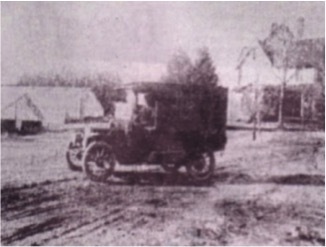 The company remained at this location until 1992, when William E.’s youngest son, John C., joined the family business. They moved to a new location in Joppa, near the I-95/152 interchange, perfectly positioned to expand their marketplace. It was at this location William E.’s nephew, Jay F. Tarleton, joined the three brothers on the leadership team. In 2001, founding member Charles A. Akehurst’s dream company celebrated 125 years of business! His small farming operation had been cultivated into a large, well-known and respected company, which served its community in many areas, including design and planning, construction and installation, grounds maintenance, interior plantscaping, holiday decor, and snow and ice management. The once tiny company of simply father and son now employed many from nearby communities, and serviced multiple companies, including: air parks, business parks, churches, educational facilities, industrial facilities, office buildings, governmental facilities, medical facilities, parks, planned communities, restaurants, shopping malls, and private residences in the Baltimore metropolitan area. Generational passing of the leadership of the company brought Brian E. into his father’s former role as president in 2005. Under his direction, the company opened its second location in Glen Burnie in 2008 to better serve the needs of southern Baltimore and Anne Arundel County customers. At Brian’s untimely passing in 2014, youngest brother, John C., stepped into the president position, prepared to continue to lead the company into the future alongside his brother, William K., who served as Vice President, and their cousin Jay Tarleton, who served as Secretary/Treasurer. It was this family team who opened the company’s third location in Pikesville in the spring of 2015, to better serve the needs of the communities west of Baltimore. Since John C. has taken the helm as President, the company has closed its Residential Landscape Services Department, choosing to exclusively serve the commercial market. The company operates with three main departments: Landscape Management, Interior Plantscaping, and Snow and Ice Management. In 2016, the company emphasizes sustainable grounds services to include mowing, horticultural plant health and bed care, enhancement plantings, commercial plant installation, and snow and ice removal. Begun by one young immigrant, what is now known as Akehurst Landscape Service, Inc. is a company that has weathered difficult times, faced seemingly impossible seasons, faithfully passed its leadership to the next generation, and adapted to meet the changing needs of its community. The company remains steadfastly committed to maintaining the same high standards of quality, service, and ethics that have buoyed its success through five generations.